It has been suggested that coconut oil is somewhat of a super food, with studies claiming the consumption can improve cholesterol and help lower the risk of heart disease. However, did you know that coconut oil can also be used to help us stay beautiful? Here are 8 alternative uses for coconut oil that we can all incorporate into our daily beauty routine – say hello to softer skin! We can damage and dry out our cuticles without even realising. Every day tasks, even regular hand washing can leave them dry and damaged. 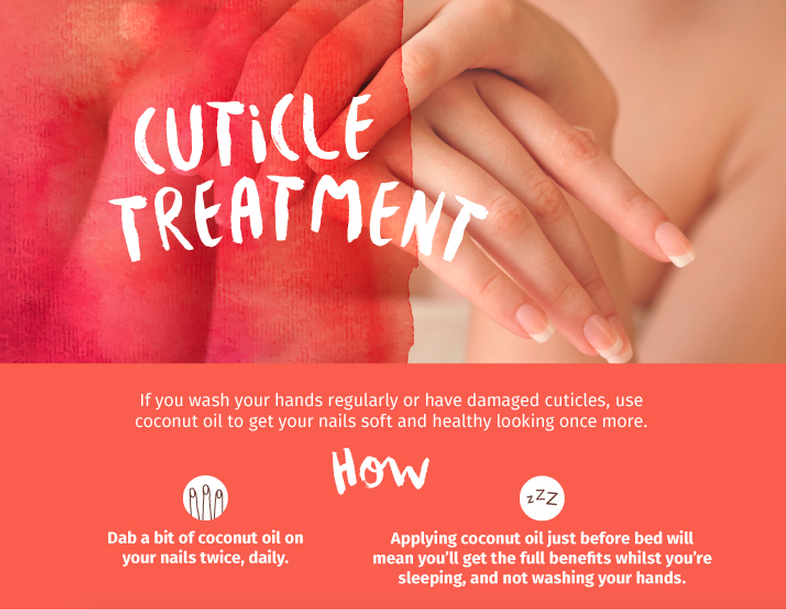 Coconut oil makes for a great cuticle treatment, with just a dab of oil daily to the nails can make a big difference, keeping them moisturised and pretty day in day out. 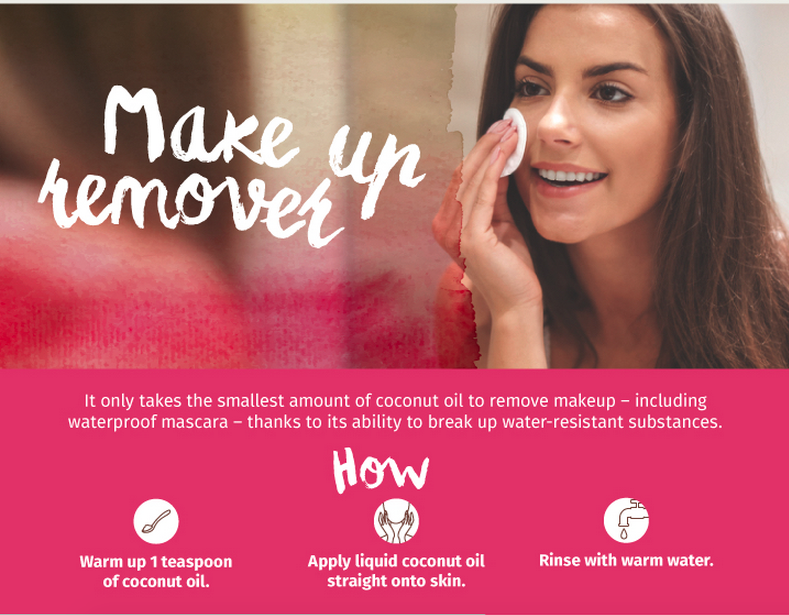 Instead of spending a ridiculous amount on fancy makeup remover, coconut oil offers an alternative. Just a small amount can rid you of a face full of makeup, including waterproof mascara and other stubborn eye products – gentle yet effective. Forget the chemical filled shaving foams, shaving with coconut oil will not only leave you hairless but also moisturised with nothing but natural products. 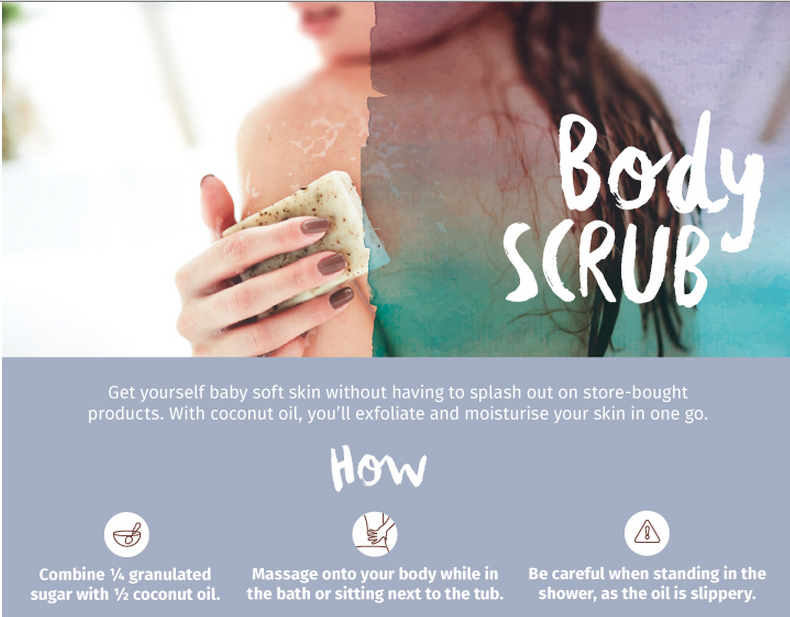 Beware, the oil will make your bath or shower slippy, so be careful not to slip over whilst using coconut oil to shave – that’s going to hurt! Combined with granulated sugar, coconut oil can exfoliate and moisturise our skin leaving no need for expensive store-bought exfoliating scrubs. Perfect before a spray tan, self tan, holiday or just incorporated into your weekly beauty regime. Combating dull hair can get expensive, with such an extensive market where does one begin? 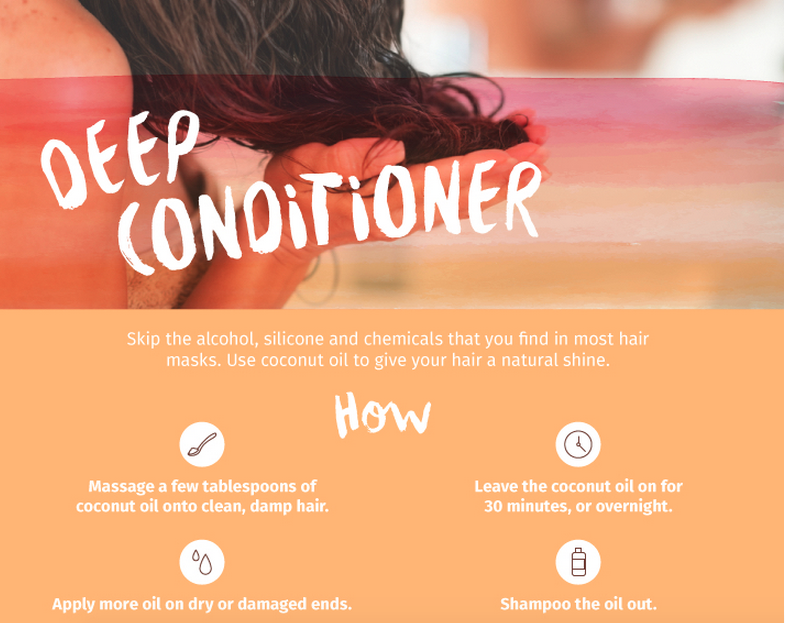 Coconut oil can offer a natural alternative with just a couple of tablespoons. Leaving the oil in your hair overnight will give the same desired result as some of the most expensive products on the market – without the swipe to your bank balance. Oil pulling is said to leave you with a whiter smile and fresher breath, with just 1 teaspoon you can swish your way to a cleaner and healthier mouth. 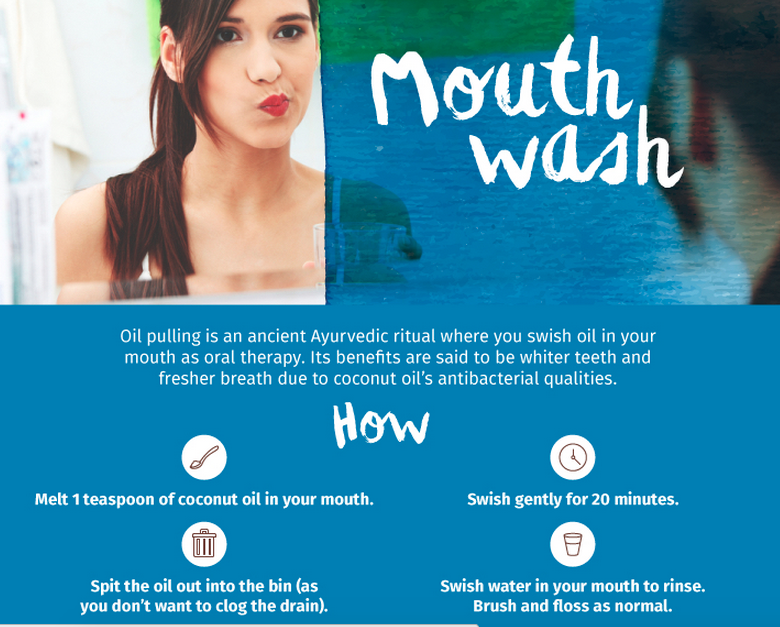 Say bye-bye to the alcohol and chemical filled mouthwash, coconut oil can be used every evening for 20 minutes or mornings if you would prefer. 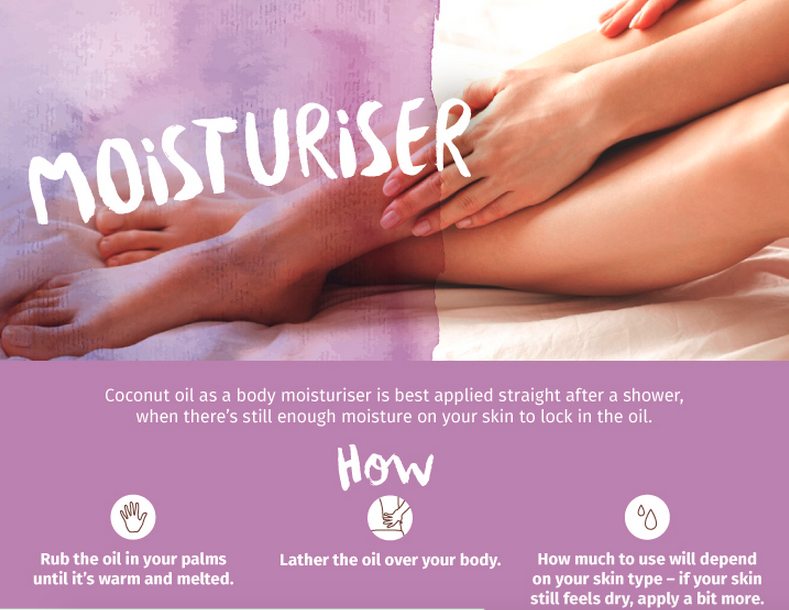 Coconut oil can help to keep skin moisturised after a shower or bath and can be used as a natural alternative. The amount you need will vary from person to person but applying after a shower can ensure extra moisture is locked into your skin. 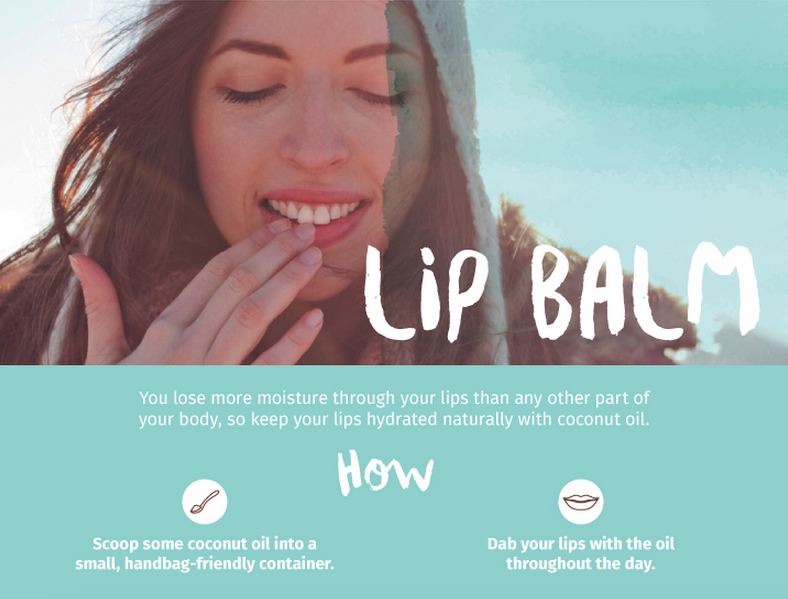 Keeping our lips moisturised can be a tricky task, especially when one is feeling a little run down or the weather isn’t doing any favours. Why not get a little container and fill it with coconut oil to rub on your lips throughout the day, this will help to keep them soft and stop them from drying up later in the day. Hi there, thanks for visiting and liking my blog! You are absolutely gorgeous and I love this post. It’s very informative. It’s funny because my grandpa always raves about coconut oil as well! He literally uses it for everything.